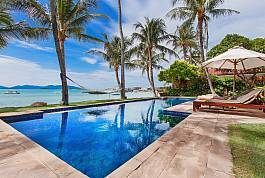 Bangrak Beachfront Villa is a dream holiday home. This luxurious 7 bedroom residence has it all. Space galore, overlooking the huge and inspiring Big Buddha, its temple and Big Buddha Bay. Take a plunge into the private pool or a stroll down the garden to step onto 3kms of stunning white sand curving around a beautiful bay. The interior of the two adjacent living pavilions are luxury personified. They offer 3 en-suite bedrooms each, and if a 7th bedroom is required this is in the building housing your private gym.